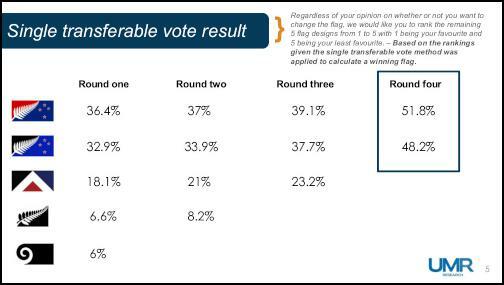 The New Zealand flag referendum was decided using an instant run-off voting procedure. Under this system of preference voting, the voters rank the choices in order of preferred alternatives. Notice how voting occurs over several stages or rounds and how the choice with the fewest number of votes is eliminated during each round. Here is a reddit thread on this particular vote. This entry was posted in Culture, Voting. Bookmark the permalink.